The site banner appears across the top of every page in your TIM Tools instance. Some clients like to pick a banner from our library and use it consistently. Others prefer to change the banner frequently, sometimes with the season. Clients can also link to their own custom banner to keep a consistent branding across both their existing website and their TIM Tools instance. 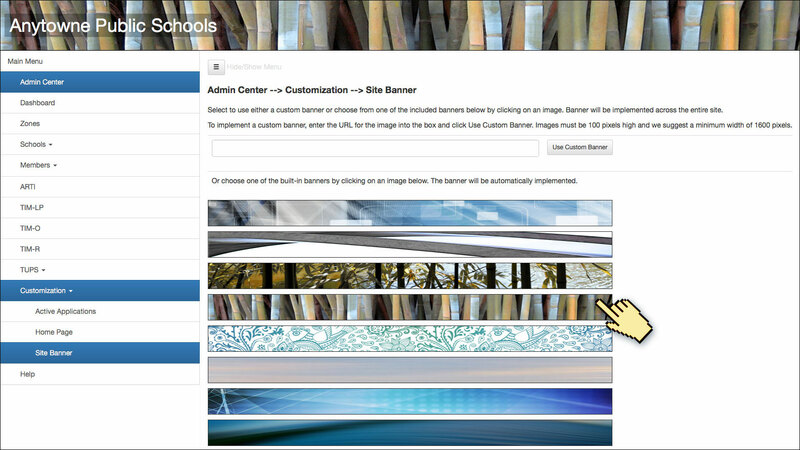 There are two ways of customizing the banner that appears across your TIM Tools instance. 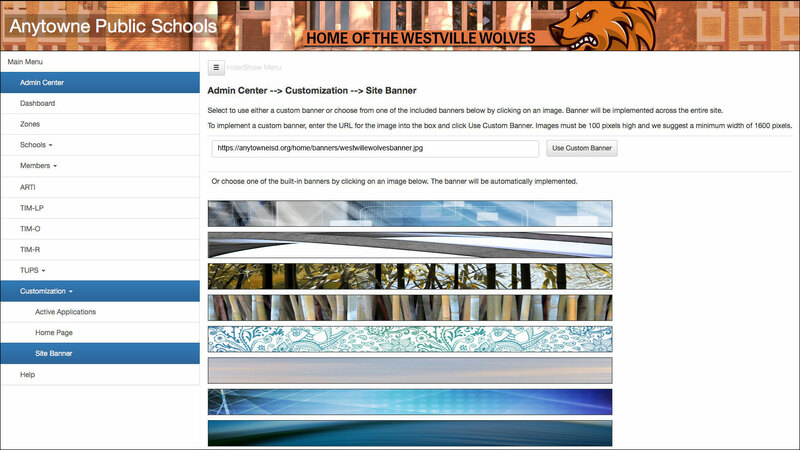 You can select one of the many built-in banners we have prepared or you can link to a custom banner of your own making. To use one of the built-in banners, just click on it and it will instantly become the banner used across your TIM Tools instance. You can change the banner image as often as you wish just by clicking on a different built-in banner. We’ve given you over 100 banners to choose from. Figure 1. Clicking on a built-in banner to select it. You may prefer to use your own banner to keep a consistent branding across your existing website and your TIM Tools instance. The banner should be 100 pixels high and we suggest a minimum of 1600 pixels wide. The banner will tile (repeat itself) if your image is not as wide as visitors have their browser window set. If you select an image taller than 100 pixels, only the top 100 pixels if the image will display. Keep in mind that your school or district name will automatically be superimposed on your banner at the left where you see “Anytowne Public Schools” in the illustration below. Place your banner anywhere on your own server and paste the URL into the custom banner text field. When you click the Use Custom Banner button, your banner will immediately appear across your TIM Tools instance. You can change the custom banner or revert to one of the built-in banners at any time. Figure 2. A custom banner image linked from district web server. Figure 3. Custom banners that repeat without visible seams.